“It was and is a thin plastic soup, a soup lightly seasoned with plastic flakes, bulked out here and there with ‘dumplings’: buoys, net clumps, floats, crates, and other ‘macro debris,’” writes Capt. Charles Moore. After first noticing this debris across a thousand miles of ocean in 1997, Capt. Moore began plans for a return trip to quantify the extent of the problem. In 1999, he assembled a scientific team that randomly sampled 3-foot wide strips of the ocean’s surface and found that micro-plastic bits outweighed plankton by a ratio of six to one. This showed the potential for plastic ingestion begins at the very lowest rungs of the food chain. In their book, Plastic Ocean: How a Sea Captain’s Chance Discovery Launched a Determined Quest to Save the Oceans, Moore and his co-author, Cassandra Phillips, combine two narratives. The first story is that of plastic in our modern economy, including how it evolved and grew into something that permeates every facet of life. The second thread is more of a detective story. It follows Capt. 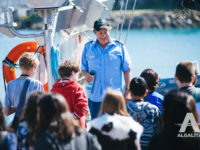 Moore as he collects data, references other people’s research, and forms alliances to combat the increasing quantity of plastic debris in the marine environment. The authors provide a whirlwind tour of “rock oil” and its by-products. As whale oil became expensive and scarce, crude oil and its derivatives were seen as a potential replacement to serve the illumination and lubrication needs of the 19th century. Some of these by-products made natural rubber more elastic and useful. Later, entirely synthetic products were produced from oil. By the early 1920s, 8.8 million pounds per year of Bakelite, an early plastic, found its way into electrical insulators, automobiles, home appliances, pens, and jewelry. Moore was not the first to study marine debris and its effects on wildlife. He reviews findings from the 1960s documenting that marine mammals, turtles, and many seabird species are frequent victims of entanglement and/or ingestion of plastic. While these events are tragic and provide the kind of photographic images that can stir public opinion into action, Moore connects the dots that show potential danger to our food supply. He cites evidence that plastics can act as sponges, soaking up toxins. If plastic particles outnumber plankton, the lowest rung of the food chain, then those particles are eaten by larger organisms which commonly consume plankton. These creatures are, in turn, eaten by even larger animals. Eventually, these particles and any toxins they may carry will be consumed by the species we find on our dinner plates. Check back next week to learn about Captain Moore’s tips to reduce plastic use and waste! Photo Credit: Photo of Captain Moore addressing youth at a summit courtesy of Algalita.